Additional Info: Images from endometrium of 72 yo patient with atypical glandular cells on a pap smear. There is a proliferation of cells along the surface and in glands, but no stromal invasion is seen. The cells have high grade nuclear atypia (best seen in the high power view). 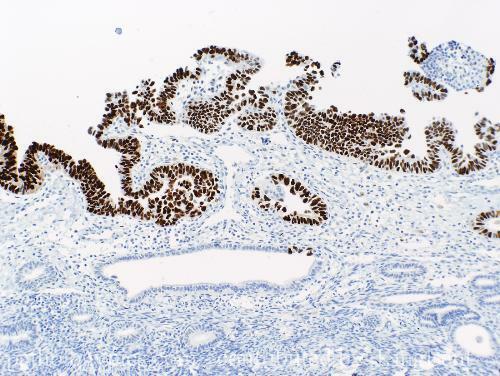 The immunostain for p53 is strongly positive, characteristic of this tumor in the endometrium. Serous carcinomas of the endometrium are biologically aggressive even when apparently non-invasive as in this case.